This is Herr Fritz Von Red Baron guiding in his ZEPPELIN oppos. SPEAKERS ? I am always a little amazed that this deck-mounted plaque is never mentioned or shown by the thousands of devotees of HMS Ganges, and yet as a boy, I can remember it vividly. 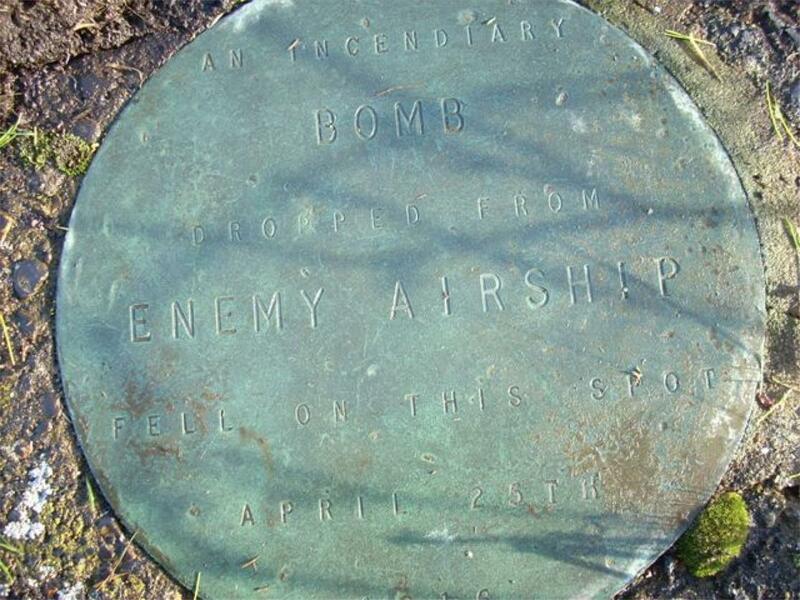 The event date, just off screen at the bottom of the plaque was 1916, and the device landed literally just a few feet from the mast. In this picture I have drawn its position. This date was just a few weeks before the famous Battle of Jutland took place. Other bombs also fell on HMS Ganges. Four of us visited HMS Ganges on the 19th of January 2009. We managed to get access to the site but the security guard was non too keen to allow us anywhere near the mast for health and safety reasons. However. much to our amazement he disappeared back into his caboose preoccupied I think with the Monday newspapers and the weekend sporting stories, and so we approached the mast. I cleaned off the grass and the moss which was part-hiding the bronze plaque and then this super photograph was taken by Preston Willson an ex Chief Sparker. Bearing in mind that several other artefact has been "misplaced" probably as trophies, I would consider it prudent for the Museum to lay claim to this object just in case it too "disappears" when the mast or the site restoration begins.